Background: When most people picture a robot in a manufacturing operation they see an articulated arm robot, a very popular and useful tool. But an articulated arm robot has limits in reach and load carrying capacity especially when a “gripping device” is mounted to the arm. These robots can be grouped in rows or clusters or mounted to tracks to extend the work envelope. But there is another kind of robot; a “Linear Robot” or Cartesian gantry system that can be used to cover a larger work envelope, carry heavy payloads and get the job done often for a lower cost. 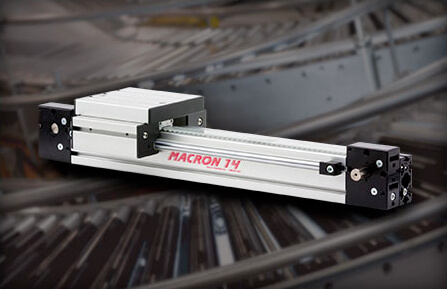 Macron Cartesian gantry systems or Linear Robots are manufactured in standard “platform” designs but are easily configured to meet a user or application travel requirement in any axis of motion. In visualizing a gantry system of linear style we think in planes of straight line movement or axes. The simplest is a 2 axis system or XY gantry. X is typically the designation of the first horizontal motion plane. The Y motion plane is layered on top of the X and generally moves perpendicular to the X plane. To create a 3 axis system we add a Z axis, often in a vertical motion plane. The language is simple; X always represents the base plane, if the system is 2 axis in horizontal planes we call it an XY system if the motion plane is in a vertical orientation we call it an XZ system. Whether the design is XY, XZ or XYZ Linear Robot the work envelope is box-shaped in a size relative to travel needs. The photo below shows a Macron MCS-UC3 heavy duty gantry. This 3 axis Cartesian gantry is mounted to a structural steel frame for additional stability. The X axis is a pair of MSA-14H actuators with 4 carts supporting an MGS-UC3 2 axis standard gantry. The travel envelope for this gantry was; X = 6 meters, Y = 3.5 meters and Z = 1.5 meters. Linear Robots or Cartesian gantry systems are a viable alternative to rows of articulated arm, SCARA and delta robots. All motor and control system manufacturers have products that can control the fluid motion of a Cartesian gantry system. They are as easy to program as any other robot system too. 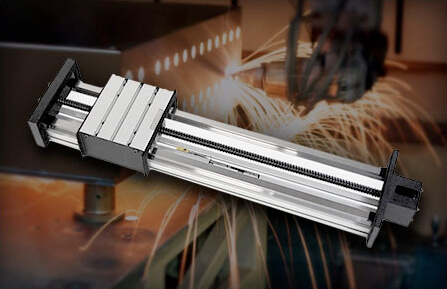 For your next automation system project, explore Linear Robots as an option. You may find they are a flexible and economical solution. For help selecting the right Linear Robot for your needs, please contact one of our expert representatives located near you.